Today is the Transgender Day of Remembrance, and activists and organizations discussed what the day means to them. Mara Keisling of the National Center for Transgender Equality said that preventing violence is about a lot more than laws against violence – it’s about creating a system of respect and equality. Every year we are asked by friends and allies what they can do — what anyone can do — to prevent these tragedies. Laws that protect the rights of transgender people are a start. But each of these 26 beautiful lives also deserved a community they could trust, and a society in which they could safely be themselves. But it’s understandable that people who are isolated from and alienated by their communities will not trust that community. People who are routinely abused by the police, as so many transgender people of color are, will not trust the police. People who are disregarded, invalidated, and erased by their government will not trust their government. This failure to protect and serve some of the most vulnerable people in our country today encourages this violence. It provokes this violence. It renders too many transgender people of color invisible, their lives and struggles only noticed once their blood has spilled. Today, as we remember those lost to hate and prejudice, we must recommit ourselves to real, lasting, and life-saving change. So welcome transgender people into your community. If you are hiring, hire transgender people. If you are a parent or a teacher, push for policies that keep transgender youth in school. And if you work in law enforcement, fight for training, fight for sound policies, and fight to give meaning to the oath you swore to protect and serve. None of us can ignore prejudice and hate without promoting prejudice and hate, therefore it is incumbent on all of us to fight for a better today. We must fight like the lives of transgender people depend on it because the lives of transgender people do depend on it. 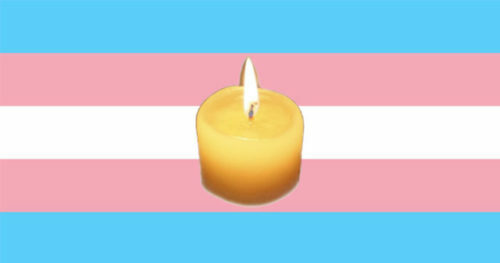 On social media, ILGA remembered the 369 transgender people killed worldwide this past year. HRC and the ACLU remembered the transgender people killed this year in the United States. Others highlighted incarceration as a source of oppression. On social media, activists posted artwork to express what the day means to them. There will haters, there will be non-believers and even doubters. Then there’s you. Proving them wrong.